You’ll have to wait till Friday to see the painting of Donald Duck with his head sliced open and an egg frying on his brain: that’s when Nychos’s show “Silly Slicesophy” opens at Mighty Tanaka in DUMBO. 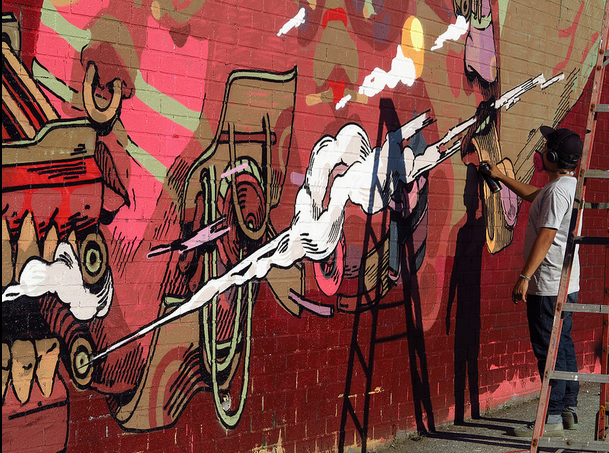 In the meantime, the Austrian artist is spending his time in New York painting a mural on the side of Tutu’s in Bushwick. All good things must come to an end: Aliya Naumoff’s portrait of Kim and Thurston will be on display tomorrow. Fuse Gallery, the little space behind Lit Lounge, is closing after more than a decade. 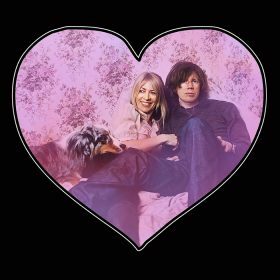 Owner and curator Erik Foss just sent out the e-mail: the show that opens tomorrow — featuring Aliya Naumoff’s potraits of Iggy Pop, Marilyn Manson, and Karen O — will be Fuse’s last, and the East Village gallery will pack up after “Perceptions” closes on Sept. 11, of all days. 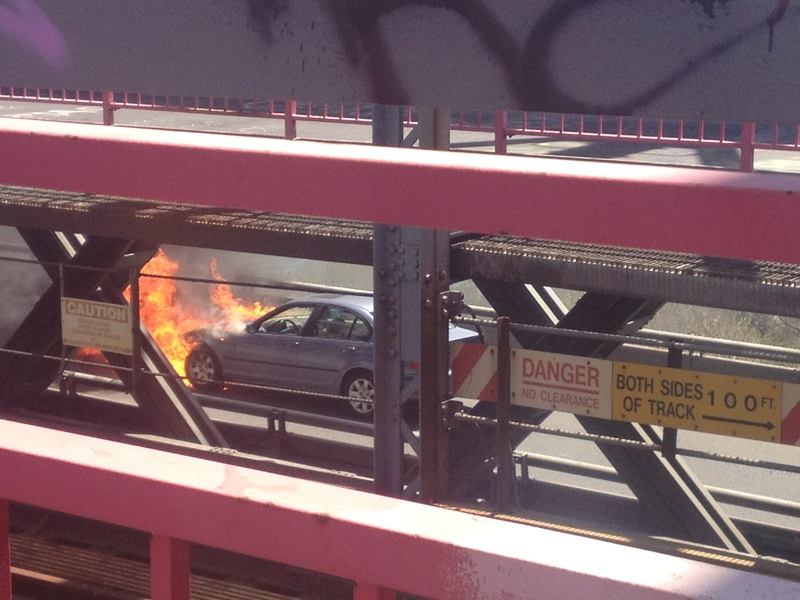 High drama on the Williamsburg Bridge this afternoon, as a car headed for Brooklyn caught fire shortly before 1:47 p.m. The blaze, which shut down the east-bound lane, was extinguished by 2:39 p.m., but not before some folks on Twitter and Instagram got some pretty intense shots. It’s uncertain what caused the fire; no one was injured, the FDNY said. 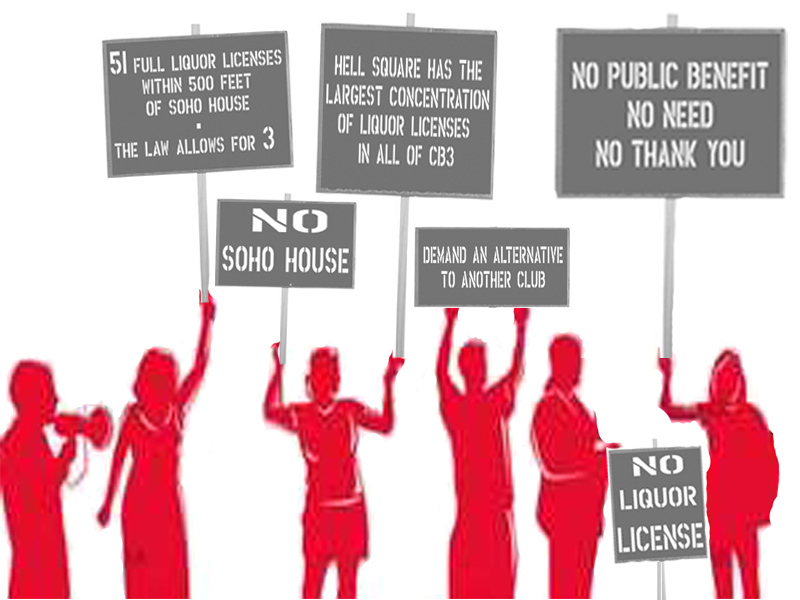 Petition Against Soho House's Ludlow Street Location: 'Enough Is Enough!" With a critical hearing coming up later this week, the LES Dwellers have launched a petition against Soho House‘s plan to dance on the grave of Max Fish by plopping down on Ludlow Street. Since spring, the mostly anonymous crew of Lower East Siders who make up the Dwellers have campaigned heavily against Soho House’s plan to occupy three stories and a rooftop bar at 139 Ludlow. In late May, Community Board 3 recommended that the State Liquor Authority deny a liquor license application, and now the club will plead its case to the SLA at a “500 foot” hearing on Thursday. Some days ago Williamsburger Matthew Schonfeld got up at 5:30 a.m. to wait in line for a cronut, and then he jumped in the line at the new Umami Burger to create the “Umami cronut burger”! Maybe it would’ve been the “hypebeast Frankenfood of the decade” had the Ramen Burger not debuted at Smorgasburg this Saturday. As you can see in the above video, the line for Keizo Shimamoto’s burger between fried-noodle buns was “redonk” even though it was raining. (And this wasn’t the type of rain New Yorkers normally line up for). Today, a Mexico City artist will complete a 200-foot-long mural on a Bushwick wall that had previously been covered with work by JR and Jim Avignon. SMITHE started the epic piece Monday of last week, but the story of the wall goes back to 2007, when Ali Ha opened Factory Fresh, a gallery focusing on urban art, just around the corner from a derelict alley. After yesterday’s Girls shoot, we were like, stalking celebrities is fun! But how could we keep it up with Girls all the way up in Gramercy today? 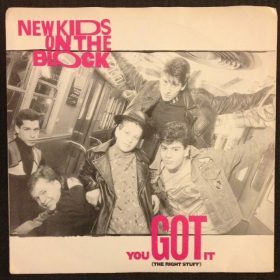 The answer came to us when we spotted a bunch of paparazzi milling around outside the Bowery Hotel this morning. 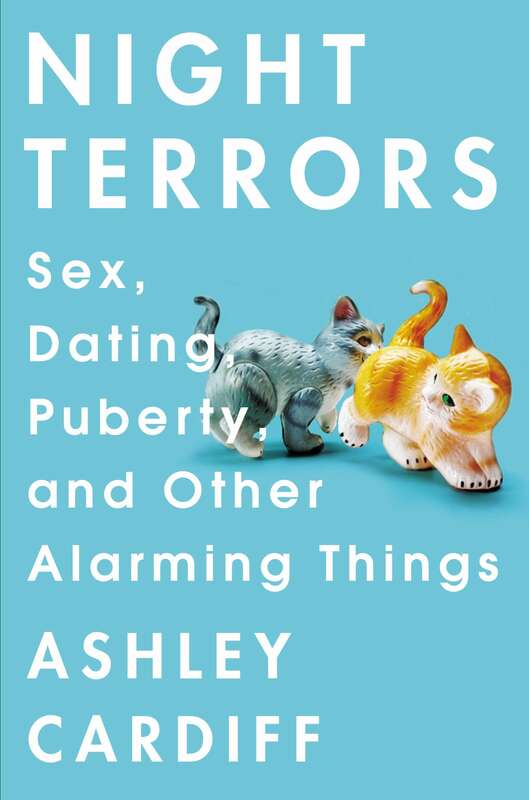 We see these guys all the time, but we’ve never thought about getting in on the action. This time, however, we asked them who they were waiting for. 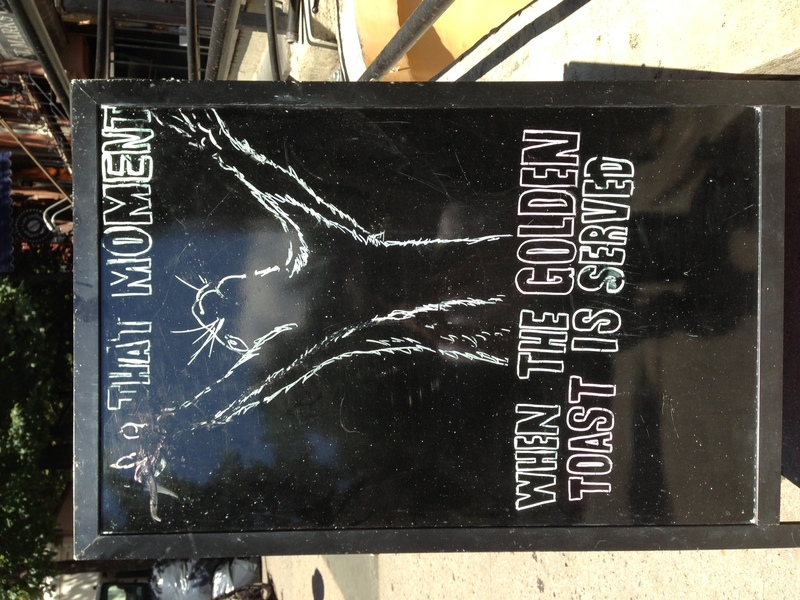 Was it Yeezus? Hova? Or could it be Solange, fresh off her laundromat tour of Brooklyn? 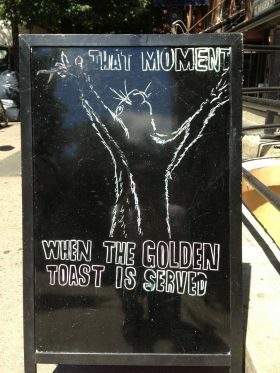 With Iris Cafe Closed, Wherefore Art the Golden Toast? Sadly, Iris Cafe seems to have closed for a “store remodeling,” according to a sign on the window that apologizes for the inconvenience. After dropping a sought-after collab with Mark Gonzales this spring, New York City brand UXA continues to push creativity with a new video titled “#TheChase.” Starting at the Astor Place cube, downtown’s most famous meet-up spot, the grainy black-and-white mini-movie follows pro skater Eli Reed as he slashes through lower Manhattan, trailed by some very large thugs played by Lower East Side natives Carlito Olivo and Johnny Diaz. 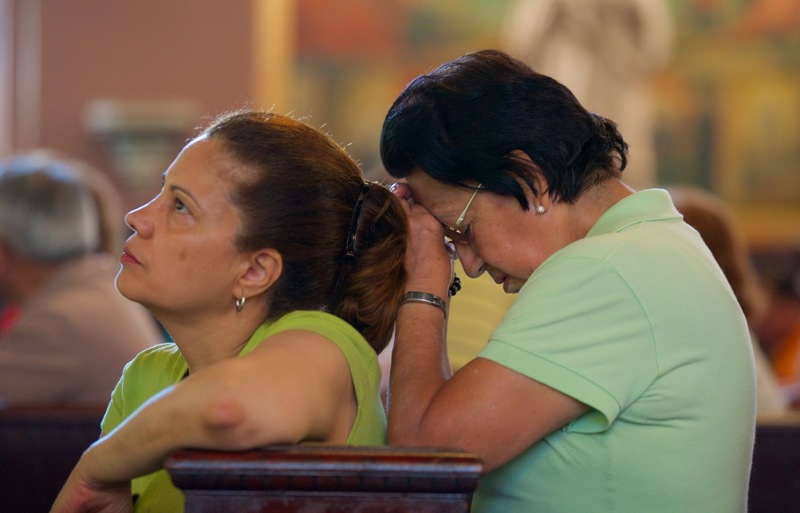 For almost two months now, Salvadorian immigrants have been streaming into the basement of Transfiguration Roman Catholic Church, a red-brick edifice built more than 125 years ago by Irish and German beer barons. With a July 29 deadline looming, they come to the corner of Marcy and Hooper to reapply for Temporary Protected Status, so they can continue to live and work legally in the U.S. without fear of deportation.